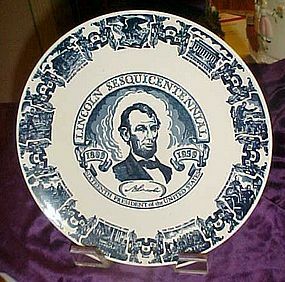 Our 16th President Abraham Lincoln: Lincoln Sesquicentennial glazed ceramic plate measures 10 1/8". Image of Lincoln in center. "Lincoln Sesquicentennial 1809 1959 Sixteenth President of the United States" circles the image. Rim of plate shows events in Lincoln's life including birthplace, chopping logs, Lincoln-Douglas debates, first inaugural, the Civil War, Emancipation Proclamation, Gettysburg address, and Lincoln Memorial. Very attractive. Cobalt blue on white. Produced in 1958 by Kettlesprings Kilns in Alliance, Ohio. Perfect comdition with no chips, cracks or crazing. I have 2 available. Price is per plate.